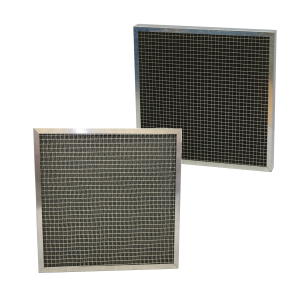 High performance air filters are rated to achieve efficiencies F6, F7, F8 and F9 to EN779, and are used to give medium to high air quality suitable for use in applications such as supply air to offices, hospitals and swimming pools. High Efficiency filters are typically offered in the form of Multi Pocket Bag Filters, Rigid Bag Filters and High Performance Rigid Pleats. 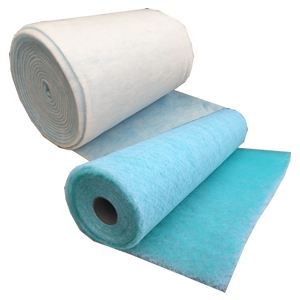 These filters are always offered as the primary solution to achieve high quality air, as they have a high filter media surface area offering a long filter life and the ability to handle large air capacities. On occasion we find our contractors and system designers demand a high efficiency filter that does not take up the space (depth) that a bag filter or rigid pleat filter will take up in an air movement system. To meet this demand Airclean offer High Performance Pleated Panel Filters in grades F6, F7 and F8 to EN779. Airclean High Performance Pleated Panel Filters are available in 98mm, and 47mm thicknesses allowing high efficiency filtration to be achieved in spaces which do not allow for bag filters. The high efficiency panel filters are of standard cardboard or metal frame construction identical to the typical lower grade G4 panel air filters and can be identified by their coloured pleats pale green (F6 to EN779), pink (F7 to EN779), and yellow (F8 to EN779). The life span of a high performance pleated panel filter in most situations will be less than that of a Multi Pocket Bag Filter or Rigid Pleat as it has a lower dust holding capacity. This does not make it a very energy efficient filter, and can result in high replacement costs, but when space is a premium this filter is available as a suitable solution.